This climb takes you through moderate knob climbing paradise. A 5.7 crux down low is followed by enormous and comfortable knobs more reminiscent of the climbing gym than Yosemite. To make things even better, cracks appear frequently to offer ample protection. Be sure to use many long slings down low to cut down on rope drag. Which SuperTopo guidebooks include a topo for Sloth Wall? 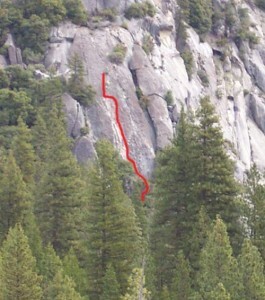 Knob Hill is a great introduction to longer Yosemite 5.7 and 5.8 pitches.